Too Damn long to write here! Reviewed By: Silver "Questionable Ethics" Sorrow, with the invlauable input of Starfox. Note: The screenshots in this review show that I was not only using just a couple of graphical mods, but a LOT of graphical mods; more mods than you can toss a Dwarf at. I could have removed them all, but really: what a pain in the Elf. So in comparison to most other screenshots you see, my game may look a little different; better textures, characters, more hairstyles, cooler armor, etc. Just think of it as what's possible with the game. One thing I must tell you though: you likely won't get your characters to look like mine just through the in-game chargen. I created their headmorphs in the Toolset with the help of a half-dozen cosmetic mods. I tried to keep the screens generic and scenery-centric in nature, but sometimes the shot was too good to be true. 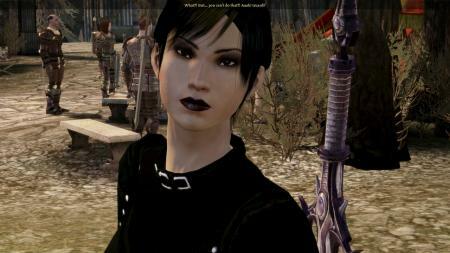 A good place to start would be Dragon Age Nexus and start browsing categories; besides fifty-three thousand useless "This Is My Take On Morrigan And Leliana!" mods, you will find a few useful things...but first, make sure you get a good ad/popup-blocker first, because they loves them some ads. This review contained many bad words...well, in number according to frequency of usage, that is. I tended to stick to several questionable words and use them a lot. However, in the interest of not turning this into a lowbrow slog through the gutter -- yes, this game really pissed me off that much -- I decided to replace the worst of the lot with less objectionable words. This is a common practice with some forums' language filters, and I'd rather amuse than be just another (cursing) voice in the crowd. In gratitude for the tremendous outpouring of apathy towards the Abstract of one of my other reviews (I think it was Mirror's Edge), I will admit that, yes, I do have some glimmer of insight into what the dreams meant; I did take *some* Psychology in school, after all. "How much is 'some'?" you ask. "Enough," I reply. Because once I realized that I'd have to train mice to do this or that, I was hesitant...and then I was informed that I'd have to give an oral report somewhere down the line, and that's where I said no thanks to an education in Psychology. I mean, training mice is one thing, but revealing to a group of strangers that Dr. Pepper lip gloss irritates my urethra is asking far too much in my opinion. Some things should be kept between intimates. That probably needs some sort of explanation. Well, I think we owe our readers a bit of explanation there. Usually, reviewers play a game once, twice at most before publishing a review. Here, we played the game a gazillion times before coming up with this. 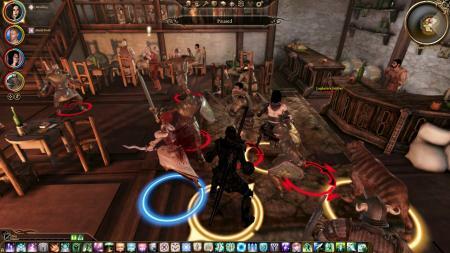 Normally it isn't much of a problem but Dragon Age is a particular beast. It is an excellent game (at least in my opinion) but plagued by tiny little things -- gameplay decisions, various bugs still unresolved -- that are not overwhelmingly apparent when one plays the game for the first time but that are becoming more and more present -- and unnerving -- in the following playthroughs when you don't have the pleasure of the novelty to sustain you anymore. As I said, we played this game a lot and consequently we couldn't help but notice more and more the tiny wrong bits. Consequently this review might seem bitter in some regards -- especially Silver's parts which form the bulk of the review -- even though the final score given to the game is quite OK.
Way back in yesterwhen a few guys decided to go to Heaven** but they corrupted it with their presence and were cast back to earth as twisted monsters and all hell broke loose and like a zillion people died and there were dragons and monsters and killing and screaming and wholly unquantifiable amounts of basic despair and then a bunch of guys calling themselves the Grey Wardens like totally kicked their asses and everything was okay again and a few hundred years went by and now the bad guys are coming back again and this is where you come in because it'd be a pretty boring game if there was nothing to do several centuries AFTER all the cool stuff happened. Well, the story is more complicated and tortuous than that but fear not, there is a gazillion of codex entries (near 300) you may gather through the game that will tell you all you need to know about the history, the world, the current situation and many other things... if you're not afraid to read. One of the strong points of Dragon Age is the richest codex I've ever seen in gaming. But even there one of the many little bad things of the game shows up: you need very good eyes and a sizable dose of aspirin so tiny the letters of the codex are on a Full HD widescreen (unless you're the fortunate owner of a 32'' panel -- at the very least ). Like for a lot of things in Dragon Age, there's a third party mod to rectify what was clearly a design oversight. Too bad Bioware didn't thought about including that in the game first-hand. You are [name], a [gender] [race] [class] with [impressive gender-specific body part(s)], and after [origin story] you were recruited by Duncan, a Grey Warden, who sees a lot of potential in one so unleveled as of yet. There's a Blight a-happenin' and you're going to spend the rest of the game gathering allies, recruiting a variety of party members, looting unguarded crates, running all over the place, and fighting stuff. No, no...don't cry. It's just a game. Where The Hell Is This, This Hell Where This Is? So you spend the game traipsing all over this Ferelden place, which is picturesque at least. There's no allegory for Holland, which is just as well; I'd have the insane complusion to go around sticking my finger in dykes. DIKES, I mean. Dikes. Copyright © 2006-2011 The Foxhole and contributors. All rights reserved. Products logos and trademarks are the properties of their respective owners. This site is compatible with Internet Explorer 7+, Firefox 2+, Opera 9+, Safari 3+. Previous versions of these browsers are not officially supported.